Grover(Abbott) and Wilbur(Costello) need to find a horse to replace one that Wilbur inadvertently has killed. They accidentally steal the most famous Race Horse in the country, Tea Biscuit. A reward is offered for return of the horse and the boys realizing their mistake attempt to return the horse in time for the big race. Wilbur riding Tea Biscuit wins the race. However Grover is the only person to bet on the winning horse and they use the winnings to replace the horse they killed. Not the best of their movies it is bogged down with way too many musical numbers which slow down the pace of the story. Abbott and Costello do three of their more famous routines "The Mudder Routine", "The Fodder Routine" and "The Fore Hoofs Routine". Although these routines are hilarious the rest of the movie has very little laughs in it. The movie was the last of Abbott and Costello to be released on video due to legal issue with the estate of the writer Damon Runyon. The Abbott and Costello Radio show ran from 1940 to 1949. Bruce Forsberg has created a PDF file that logs every one of these radio appearances. The log is comprehensive and concise. Each episode is listed by date as well as listing 9 points of information: SOURCE,ORCHESTRA LEADER,VOCALIST,SONGS,SPONSOR,ANNOUNCER,GUEST,NETWORK and SHOW NOTES. Any Abbott and Costello fan who has ever listened to one of the radio shows will find this log amazingly useful. The information is helpful and easy to find for which ever show you are listing to. 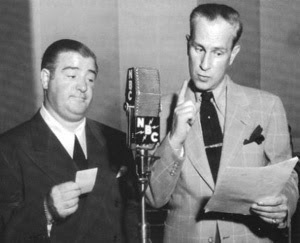 The Log also includes appearances that Abbott and Costello made on other radio shows including The Kate Smith Show and The Edgar Bergen and Charlie McCarthy show. So do yourself a favor and go to Bruce's website http://users.tns.net/~forsbergweb/index.html and download the latest verison of the Log (currently version 2.6). A new book on Abbott and Costello will be released on March 8. It is a study of the War time films of Abbott and Costello.I have yet to get my copy but when I do will be writing a review and posting it here.